My dear old friend has come through for me again. A good dusting, some polishing, and a little tightening. A fresh, new drive band. A little extra attention to the spot where a spider left its calling card (how appropriate, eh?). Assemble the tools. Where is the beaded orifice hook? The Navajo sheep that must hang from the tension screw? What about the lazy kate, not to mention all the bobbins? Ah, there they are, not lost after all. The fiber: Baby Cotswold, first. Good, but our conversation isn’t going anywhere. 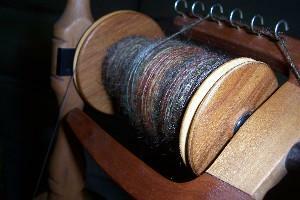 Next, the carded batt from Tintagel Farm, all the colors of Autumn. We are in a deep discussion in no time. We understand each other perfectly. Deep breaths, quiet rhythm, draw and let the twist travel. Settle, relax. Everything is as it should be. Almost makes me want to start spinning, almost! beautiful colors.